Died 6 December 1939 at Walter Reed Hospital, Washington, D.C.
Captain Osmun Latrobe of Baltimore, who is in the Thirteenth U.S. Cavalry, has been recommended for a rescue medal for gallantry for risking his own life in the icy waters of Mormon Lake, Mexico, to save the life of an enlisted man according to a dispatch last night from the United States Army Field Headquarters in Mexico. Captain Latrobe, with a detachment, was hunting on the lake, and one of the party shot a pelican. While attempting by swimming to reach the bird, which fell some distance from the shore, the hunter was seized with cramps. Three of his companions endeavored to reach him, but also were numbed by the cold and forced to return to shore. The effort by Captain Latrobe was successful, but both he and the enlisted man became exhausted 80 yards from the bank and had to be dragged ashore. When Cuba began its struggle for freedom from Spain, Osmun Latrobe, then a young draftsman in the firm of Baldwin & Penniman, the Baltimore architects, and Stuart S. Janney, the lawyer, decided they would go down and join the Cubans. They did so and both were paid high tributes later by Brigadier General Frederick Funston, U.S.A., in an article in Scribner's Magazine. Mr. Janney came back to private life. Young Latrobe decided to continue his career as a soldier. He later saw service in Porto Rico, and in 1901 married a beautiful Spanish girl, daughter of Senora Maria Laguna, of San Juan, Porto Rico. Not long ago he and his family were living in the Philippines, where he was an officer in the United States Scouts, his post being at Corregidor, near Manila. Captain Latrobe's mother, Mrs. R. Stewart Latrobe, died in April of last year in this city. His father, who has been dead a number of years, was a brother of the late Mayor Ferdinand C. Latrobe. He was named for his uncle, Colonel Osmun Latrobe, chief-of-staff for General Longstreet in the Army of the Confederacy, who died about a year ago. Colonel Osmun Latrobe, former military aide to Calvin Coolidge when he was President, who died Wednesday night at the Walter Reed Hospital, Washington will be buried with military honors tomorrow morning in Arlington Cemetery. Services will be conducted at 11 A.M. in the Fort Myer Chapel by a chaplain from the fort. Among the pallbearers will be Stuart S. Janney, a Baltimore attorney, who accompanied Colonel Latrobe when he started his military career on a filibustering expedition in Cuba before the Spanish-American War. Both Colonel Latrobe and Mr. Janney were youths scarcely out of school when they disappeared from the city and turned up in Cuba where, after fighting with distinction with the insurgents, were appointed to the staff of Gen. Maximo Gomez, insurgent commander. Colonel Latrobe, following the the Spanish-American War in which he campaigned in Puerto Rico as a Captain of the Fourth Infantry, elected to continue a military career while Mr. Janney returned to Baltimore to practice law. As a reward for his exploits in Cuba, Colonel Latrobe in 1929 received from the Cuban government, a silver medal and a diploma, the presentation being made in Washington by the Cuban Ambassador. The son of the late R. Stewart Latrobe, who lived at 14 East Eager Street, Colonel Latrobe was a grandson of the late John H. B. Latrobe, one of the founders of the Baltimore and Ohio Railroad, and a nephew of the late Ferdinand C. Latrobe, seven times Mayor of Baltimore. he also was a nephew of another Colonel Osmun Latrobe, who was on the staff of General Longstreet of the Confederate Army. Born here in 1874, Colonel Latrobe attended the University of Pennsylvania where he studied architecture, From May 1896, until the outbreak of the Spanish-American War he was in the Insurgent Cuban Army, for a time being captain of artillery under General Calixo Garcia. In 1898 Colonel Latrobe was commissioned a Captain in the Fourth United States Infantry and later was detailed as aide-de-camp to Major General James Wilson, commanding the First Army Corps in which capacity he campaigned in Puerto Rico. He remained in Puerto Rico until 1901 when he was commissioned a first lieutenant of cavalry in the regular army. Upon assignment to the Eighth United States Cavalry he joined that regiment in Cuba. In 1902 he returned to the United States with his regiment and was stationed in Jefferson Barracks, Mo., where he remained until 1905. At the outbreak of the first World War he was sent to Plattsburg Barracks, New York, where he commanded a unit in the officers' training camp. At the close of the camp in August 1917, having been promoted to the grade of Major, he was ordered to Camp Gordon, Georgia, where he organized and commanded a unit of the Eighty-second Division, which troops originally were from Georgia, Alabama and Tennessee. He was sent to France with that division in May 1918, but returned to the United States in August of that year, with the temporary grade of Colonel, to command the Forty-second Infantry, of the newly organized Twelfth Division at Camp Devens, Massachusetts. He joined the First Cavalry at Fort Bliss,Texas in 1922 where he remained until January 1924, when he was sent to the calvary school at Fort Riley. Following the completion of that course, he returned to Fort Bliss, where he was on duty until January 1925. Having received his promotion to the grade of Colonel, he was ordered to Fort D. A. Russell, where he commanded the Fourth Cavalry until June 1927, when he was ordered to Fort Meade, South Dakota, as commanding officer at that post. It was while serving there that he accidently met President Coolidge. President and Mrs. Coolidge were spending the summer months at their home in the Black Hills. Motoring one day, they met a battalion of calvary with Colonel Latrobe riding at its head. The President and Colonel Latrobe chatted and finally the army officer was invited to the Coolidge home for luncheon. As Mr. Coolidge became interested in Colonel Latrobe's stories of his exploits, he was invited to remain for supper. 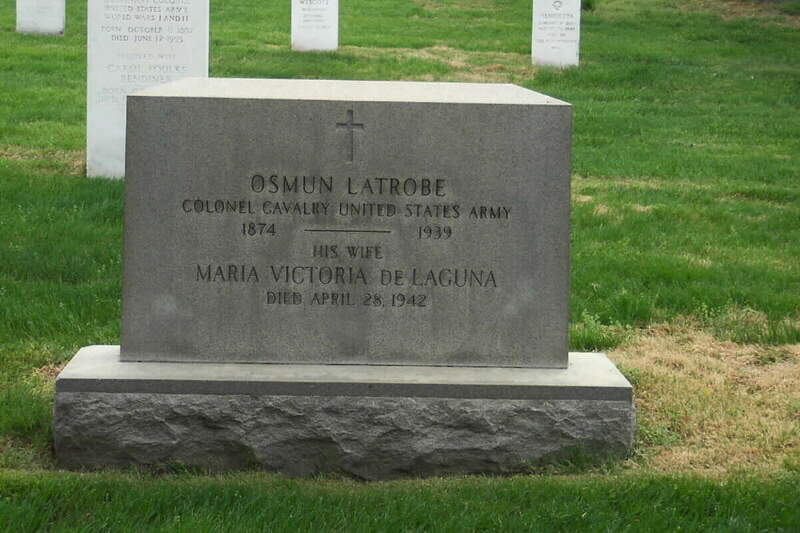 In January 1929, Colonel Latrobe reported for duty at the office of the Chief of Calvary in Washington and a month later was named to the White House staff as military aide, succeeding Colonel Blanton Winship, who was transferred to Manila as legal advisor to Governor General Henry L. Stimson. Colonel Latrobe was ordered to duty in Omaha in 1932 and later was assigned to the organized reserves at Towson. He retired a year ago, making his home in Chevy Chase, Maryland. Colonel Latrobe, in 1901, married Senora Maria Laguna, of San Juan, Puerto Rico. Biographical materials courtesy of the Latrobe Family Website.